The theme for Episode 19 is Slow Living. This is a topic that resonates with me, as I am a slow knitter! In this episode I talk about what’s been going on in my life, a special Postcrossing connection, new podcasts I’m listening to, and some interesting new yarn that I bought. I also introduce a new mini-segment that I call Knitting in the News. In addition, I review all the Ravellenics hoopla and the status of my own projects and discuss a “slow” book that I finished listening to. Listen in for all the details! This podcast is sponsored by Etsy shops Halcyarn Knitting Accessories and Evermore Studios. Thank you so much to both sponsors! Listeners’ support of these sponsors is truly appreciated, and through them you are supporting this podcast and making it possible. 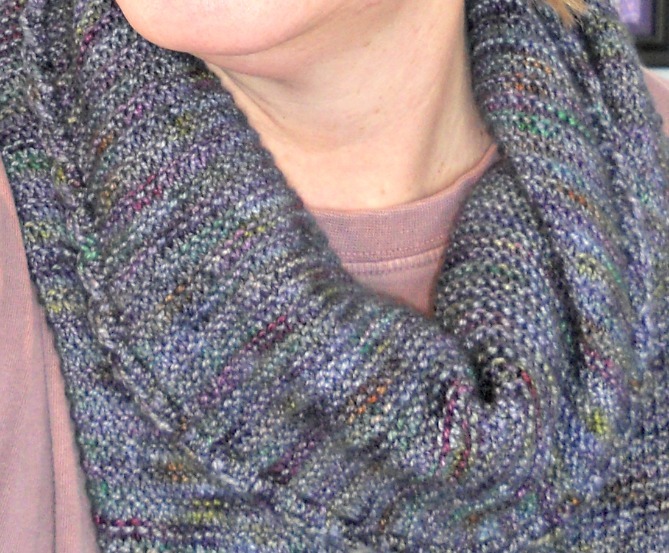 Be sure to post your finished objects in the February Graduating Class thread on Ravelry asap. On March 1 I’ll be drawing two random posts, and the winners will each receive a valedictorian prize! The same is true for the U-Turn Project thread for February. Post your U-Turn projects asap because I’ll be drawing one random winner from these posts. The lucky person will get a small pottery bowl and stitch markers! I talk about our continuing crazy winter weather, my dad’s hospitalization, what’s been going on at school, and give an update on my snail mail news. I have a sweet new pen pal, Yana, who is a young lady from Ukraine. 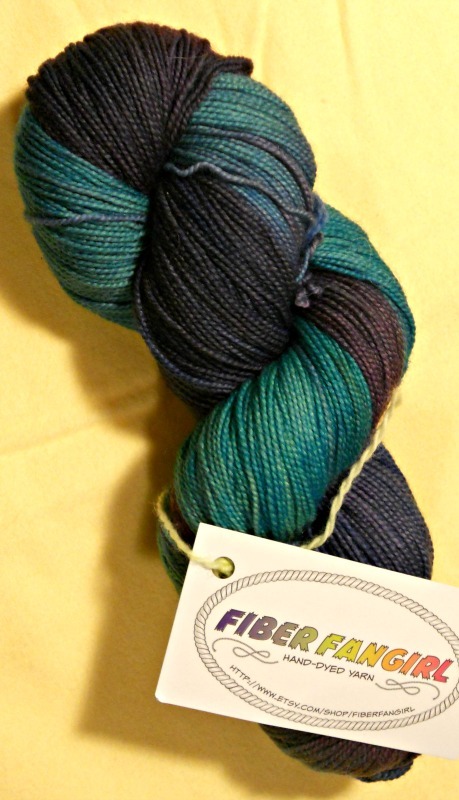 I am excited about some new yarn I bought — it is 100% East Friesian wool. East Friesian sheep originate in the very northwestern corner of Germany in an area called East Friesland, which happens to be where my mom’s family immigrated from. So when I found out about this sheep breed, I had to get some yarn from its wool. In this episode I review the characteristics of East Friesian sheep and my new yarn. Knitting in the News: A few months ago I read a newspaper article about David Babcock, a marathon runner who recently earned a place in the Guinness Book of World Records for knitting the longest scarf while running a marathon. While running the Kansas City Marathon in October 2013, he knit a scarf that is 30 stitches wide and over 12 feet long! And he finished the race in 5 hours 48 minutes. I drew the grand prize winner from all the Ewe University Ravellenians who posted their finished objects in that thread on Ravelry. We had 44 wonderful entries! The random number generator selected #15, which was from CrouchingCheese, who is Angie from Ohio! Congratulations, Angie! For the Ravellenics, Angie knit a beautiful Hogwarts Express Shawl out of Desert Vista Dyeworks Voir, and it even has beads on it! 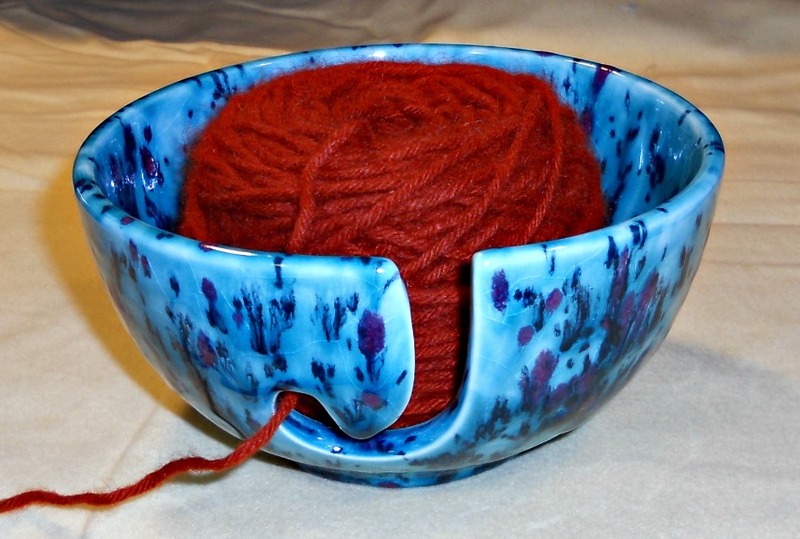 As our grand prize winner, Angie’s prize is a lovely yarn bowl from Shady Lane Ceramics. My Ravellenics projects ended up kind of a bust. I’m still working on John’s Valentine Socks. 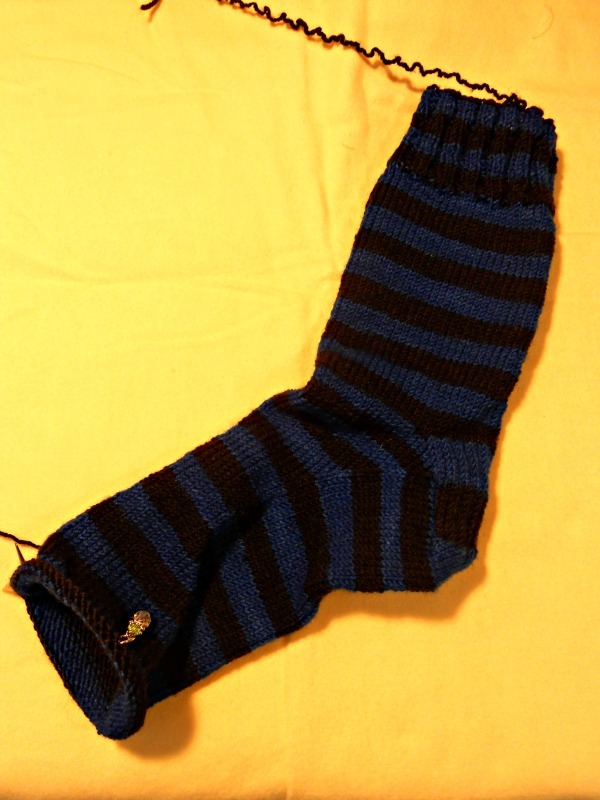 I have finished one and am on the heel flap of the second one. 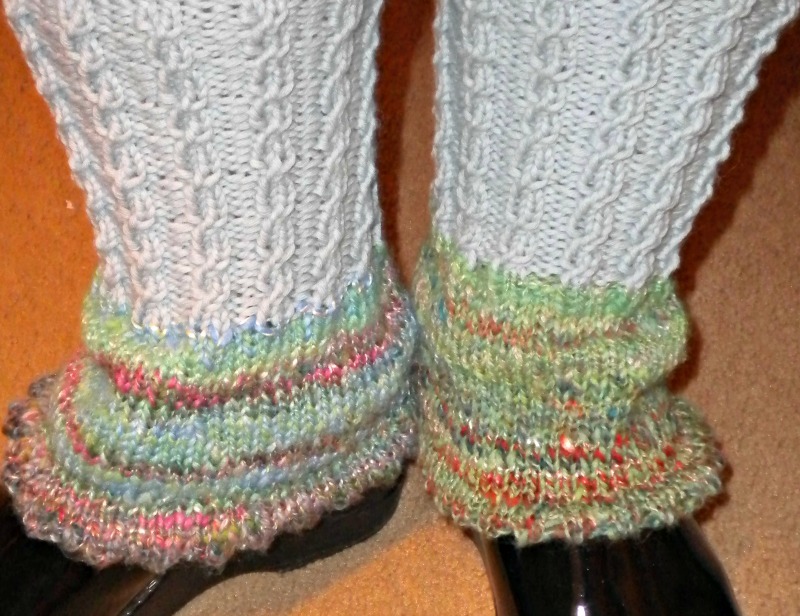 The pattern is the 8-stitches-per-inch recipe from Ann Budd’s Getting Started Knitting Socks book. 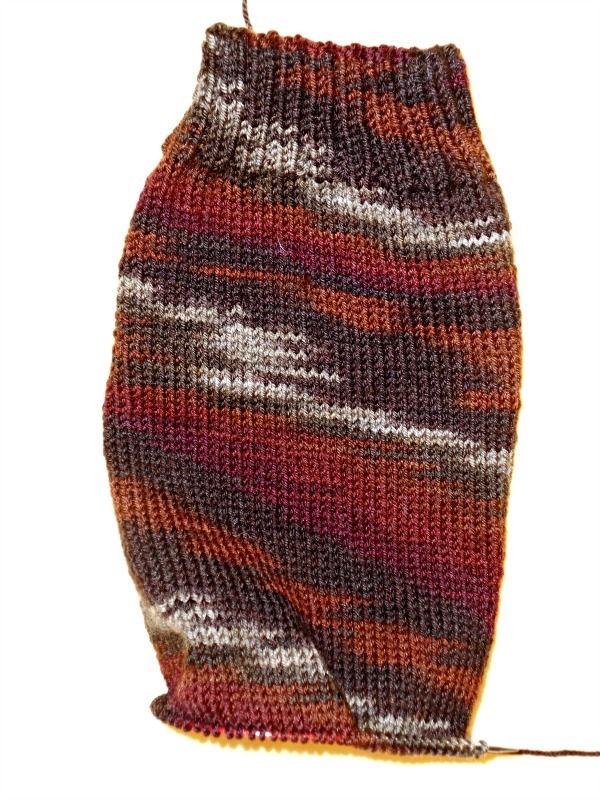 I’m using Cascade Heritage hand-painted sock yarn in color #9931. It is shades of chocolate brown, reddish brown, and tan. I think I forgot to mention that I’m knitting these socks on size 1 Hiya Hiya 9-inch circulars (my normal sock knitting needles). I finished The Minor Adjustment Beauty Salon by Alexander McCall Smith. This is book #14 in the Number One Ladies Detective Agency series. I really like it. The characters are such nice people, and the book reflects a simple, quiet, kind, and gentle lifestyle. I enjoyed this book and love the reader, Lisette Lecat. Today’s lesson is about the Slow Fashion Movement. Before talking about Slow Fashion, I cover the Slow Living Movement in general. I talk about the history of this movement back to the Industrial Revolution and through the Slow Food Movement starting in 1986, which kind of marked the beginning of Slow Living. The term Slow Fashion was coined in 2007 by Dr. Kate Fletcher, a professor at the London College of Fashion. Listen in to find out about what Slow Living means and how this applies to Slow Fashion. As knitters, crocheters, weavers, spinners, quilters, we can all participate in Slow Fashion. Listen to the show to find out how. Episode 18 features a classroom lesson on mathematics and knitting. You’ll also find out about our January Valedictorians and the winner of our January U-Turn Project. 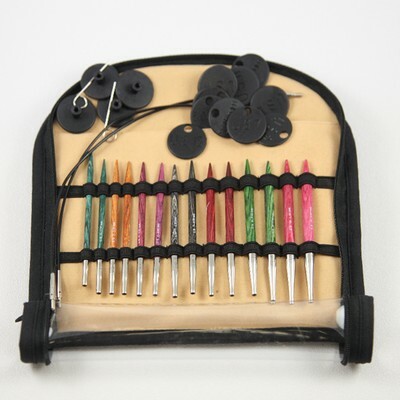 I talk about the Ravellenic Games, which started today, our never-ending winter, the knitting projects I’ve been working on, the latest book I finished, and a review of the Knitters Pride Symphonie Dreamz interchangeable needle sets. Listen to the show for all the details! Welcome and thank you to new and returning listeners! I invite you to join our awesome Ravelry group so you can participate in all the activities and contests and be eligible for prizes. I welcome your feedback — you can post comments here on the blog or in our Ravelry group. You can also send me email on Ravelry or regular email. It would be great if you sent me a card or letter via snail mail. All of my contact information can be found on this site; click on the “About” tab at the top of the page. Yay! Congratulations to our January prize winners! Post your finished objects for February in this month’s Graduating Class thread on Ravelry for a chance to win Valedictorian prizes at the end of the month. One Valedictorian will win a project bag of their choice from Halcyarn Knitting Accessories; the other will win a skein of yarn of their choice from Evermore Studios. Post your U-Turn Projects for February in that thread to enter the prize drawing at the end of the month. The winner will receive a small pottery bowl from LizKitzerow Etsy Shop and a set of stitch markers made by me. It’s a beautiful yarn bowl from Shady Lane Ceramics. Good luck to you Ewe U Ravellenians! I am excited to see what everyone accomplishes. 🙂 Listen to the show to find out what I’ll be working on. It’s more of the same old thing…the weather is super cold and we have a lot of snow! I opened a thread on Ravelry so that we can show off the beauty where we live, and I love the pictures that have been posted so far! Please, those of you living in warm or tropical climates, share your beach and warm weather photos for those of us who are stuck in the arctic deep freeze. In the show I ramble about school a little bit and give you an update on my Postcrossing cards I received over the past couple of weeks as well as the beautiful cards and post cards I’ve gotten from my wonderful friends. Thank you all! I have been on a roll for the past two weeks! I finished two projects — yay! Needles: I think it was a U.S. size 6? At the end of January I finished The Dead in Their Vaulted Arches, the newest book in the Flavia deLuce series by Alan Bradley. I liked it a lot. Listen to the show to find out why. 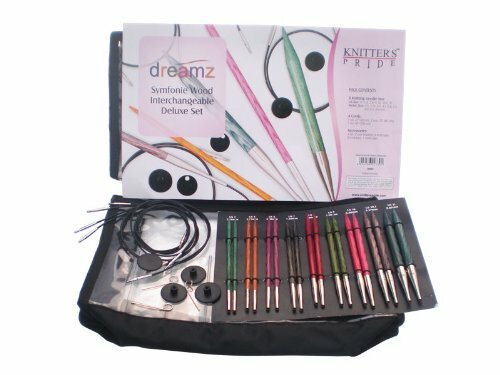 This week I review the Knitters Pride Symphonie Dreamz interchangeable needle sets that I have — the Deluxe set and the Special set. I talk about my experiences with both of these sets and why they are my favorite go-to needles right now. Today’s lesson is about mathematics and knitting. I talk about an article that I read entitled Adventures in Mathematical Knitting which was in the March-April issue of Scientific American last year. It was written by Dr. Sarah Marie Belcastro, a mathematician who specializes in algebraic geometry and who also happens to be a knitter. She has edited two books on math and knitting: Making Mathematics with Needlework and Crafting by Concepts as well as authored numerous scientific papers. In this episode I review the history of knitted mathematical models and give an overview of some of the mathematical concepts involved in knitting. Interestingly, last month (January 2014) at the joint meeting of the American Mathematical Society and the Mathematical Association of America in Baltimore, Maryland, there was a full day of scholarly talks on various topics involving math and the fiber arts. They even had a juried mathematical fiber art exhibit! One of the neatest things to come out of mathematical fiber arts in recent years is the crocheted hyperbolic models made by Dr. Daina Taimina, a mathematics professor at Cornell University. Her work was featured in a 2009 Ted Talk by science journalist Margaret Wertheim — it is so good it will give you goosebumps. You have to watch it! 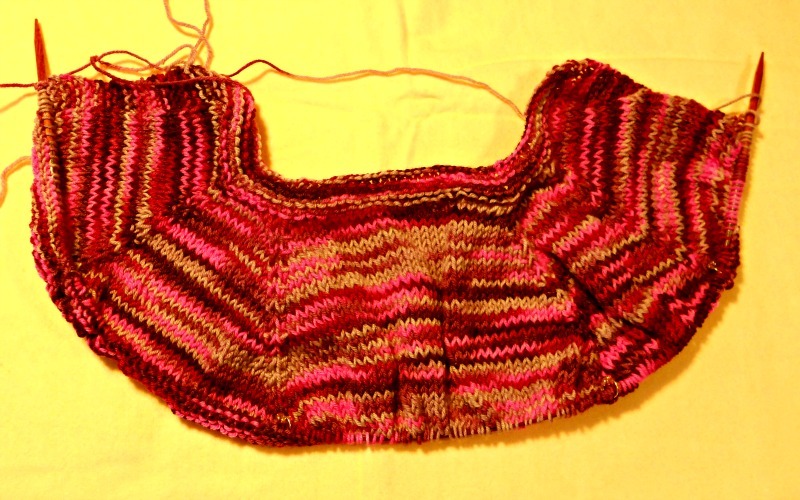 For more information on mathematical knitting, I encourage you to visit the Mathematical Knitting web site and listen to an audio podcast called Math4Knitters hosted by Laura Neel.